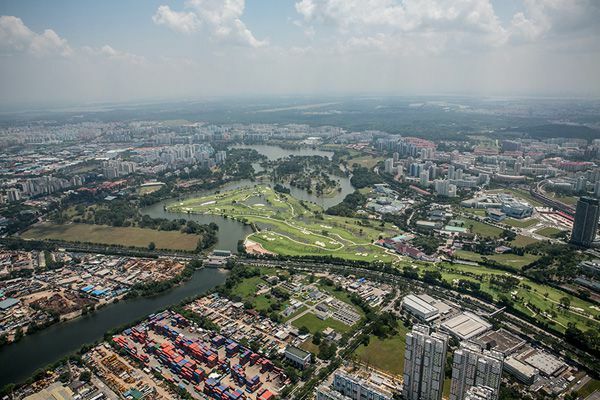 It has been confirmed by the Singapore Land Authority (SLA) that the Singapore-Kuala Lumpur High-Speed Rail (HSR) will be situated on the site where the Jurong Country Club is currently located. It was only announced on 05 May 2015 by Prime Minister Lee Hsien Loong that the HSR link terminus will be situated at Jurong Lake District, Jurong East, however no exact details were released then. It has been reported that the 67-hectare plot of land has been acquired and expected to be handed over to the SLA by November 2016. As the terminus is only expected to take up about 12-hectare of the available land space (about 18%), the rest of the unused space will be available for other development purposes, such as construction of office buildings, hotels, residential and retail spaces. All these are actually part of government’s initial plans to regenerate Jurong East into the 2nd Central Business District in Singapore, as commuters will be able to travel between Singapore and Kuala Lumpur within 90 minutes. Ng Lang, the Chief Executive representing the Urban Redevelopment Authority (URA) of Singapore, mentioned that to make the high-speed rail a success, one of the key factors is that it requires the support from a wide range of amenities and building infrastructures. And therefore, there’s a need for good-sized land in order to get this done. It was also mentioned by the government that more studies and researches would be done to pinpoint on the exact spot of the terminus, and it would only be situated at 600 metres or less away from the existing Jurong East MRT Station, and will be well connected via link ways. It will also be accessible to 2 other future major MRT lines, the Jurong Region Line (by 2025) and the Cross Island Link (by 2030). Also, the HSR was initially planned to complete construction works in 2020, however PM Lee and Malaysian Prime Minister Najib Razak have mentioned that they may need to re-assess the timeline due to the scale and complexity of the development.